​He is risen indeed! Alleluia! ​Our lighting scheme is now almost complete, with just a final few things to do. This means that the church will mostly be open as normal, with just the possibility that we may have to close at short notice for a couple of final, high level adjustments, but we are hoping to keep these closures to a minimum. We will post notices on the door if this happens, and visitors will have access to the Roucliffe Chapel from the outside door. ​St Peter and St Paul’s is a living Church, part of the Church of England Diocese of York. We have a large and active congregation, who continue a thousand year old tradition of prayer and worship. 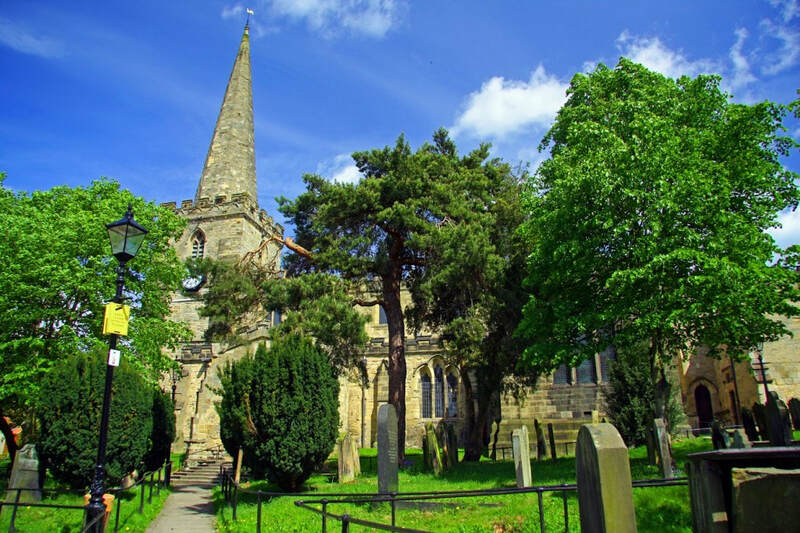 The Church is also popular with couples wanting marriage or baptism for their children; it is well used by the town for civic and community occasions and concerts, and provides a real focal point for Ryedale. Its extensive medieval wall paintings also make it a wonderful source of enjoyment for pilgrims and visitors from all over the world. The Church is open daily and is a space of great peace, valued by many who seek to draw closer to God in public worship or private prayer. So once you have explored this website, come and explore for yourself this ‘House of God and gate of heaven’. ​We would like to thank everyone who allowed us to use their photographs for our website. The Church you see today was built on the site of an earlier, Saxon building. Little is known about this early Church, and all that remains is a carved cross shaft and the bowl of the stone font. The Saxon Church on this site may well have been wasted during William the Conqueror’s ‘harrying of the North’. The early Norman Church, which was built around 1140, would have been of simple cruciform layout, with a central tower surrounded by a nave, a chancel and two transepts. Soon, aisles were added to this original structure: the north aisle in about 1150 and the south aisle towards the end of the twelfth century. The present west tower was built in the early part of the thirteenth century, and sometime in the fourteenth century the chancel was widened to cope with the liturgies of the period. A porch was also added, and then, in the fifteenth century, two chantry chapels, either side of the high altar. 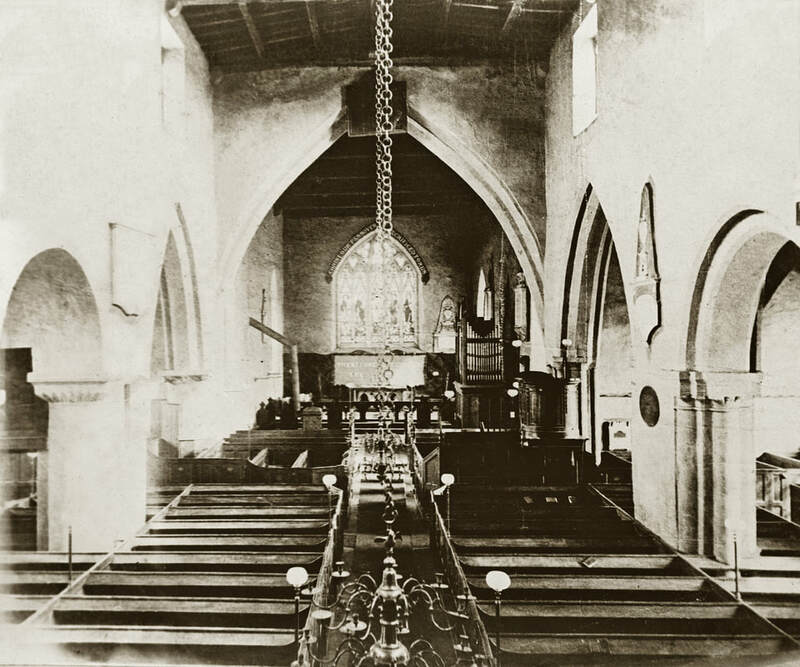 On the abolition of the chantries, the Roucliffe Chapel, on the south side of the sanctuary, was for some time a school, before, in 1920, undergoing renovations to restore it to liturgical use. 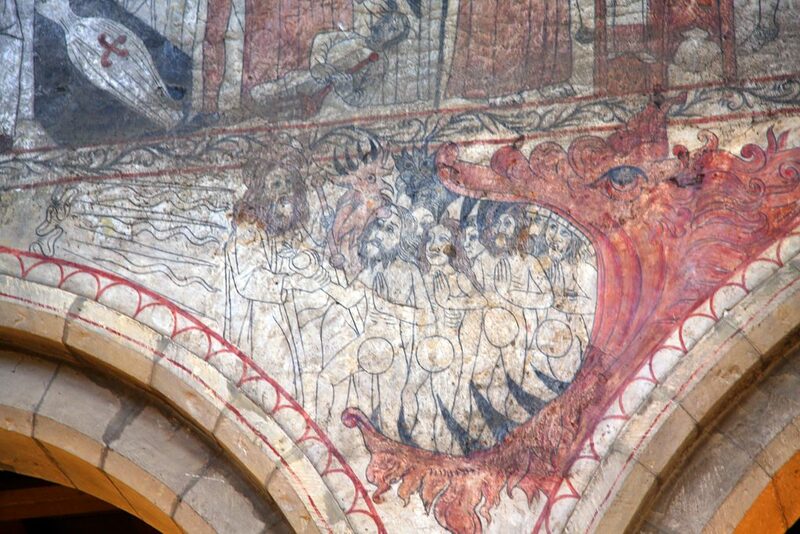 The medieval wall paintings, which give our church its fame, were probably first commissioned in 1450, and were painted the following decade, as details in the costumes and armour of some of the figures makes clear. 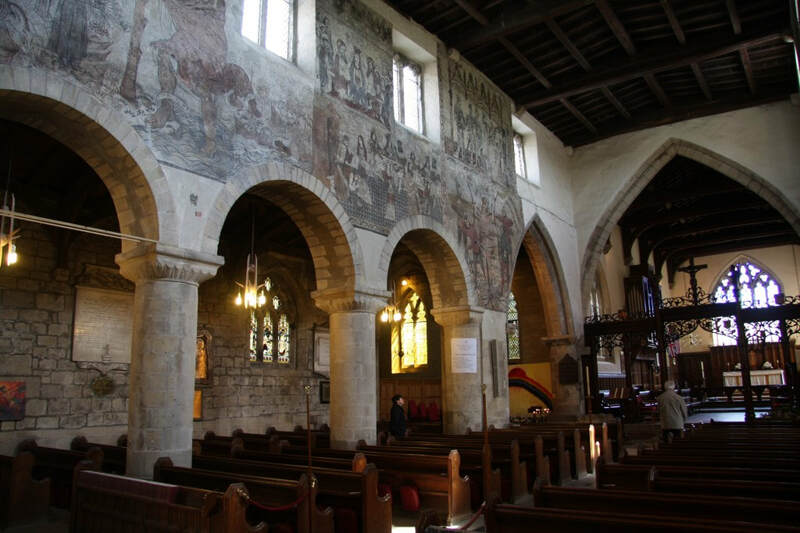 Nikolaus Pevsner, the renowned expert on architectural history said that ‘This is one of the most complete set of wall paintings… and they give one a vivid idea of what ecclesiastical interiors were really like’. They are in fact one of about five sets of such extensive wall paintings still in existence in the country. The images vary in scale and in what they depict: some are large single figures; others tell stories. Details of each scene are given in the guide book, available from the Church bookstall. Probably at the time of the Reformation, and certainly with the spread of Puritanism, the paintings were hidden from view with coats of whitewash. Only in 1852, with work being carried out to repair and clean the nave, were the paintings revealed. The Vicar at the time, the Rev’d Ponsonby, wanted them re-covered, showing his dislike of them in a letter to the Archbishop of York: ‘As a work of art [they are] fairly ridiculous, would excite feelings of curiosity, and distract the congregation’. He went on to say that ‘the paintings are out of place in a protestant Church, especially in these dangerous times’; he subsequently had them re-covered in a thick yellow wash within a fortnight of the discovery. Fortunately, what had been revealed was recorded by drawings made by W H Dykes, an assistant architect at Durham Cathedral. In the 1870s the Church underwent extensive restoration, particularly to the tower and transepts. Box pews were replaced with the present oak pews and two galleries were dismantled. A decade later, once the restoration and reordering of the fabric was complete, the firm Shrigley and Hunt of Lancaster were contracted to restore the paintings. 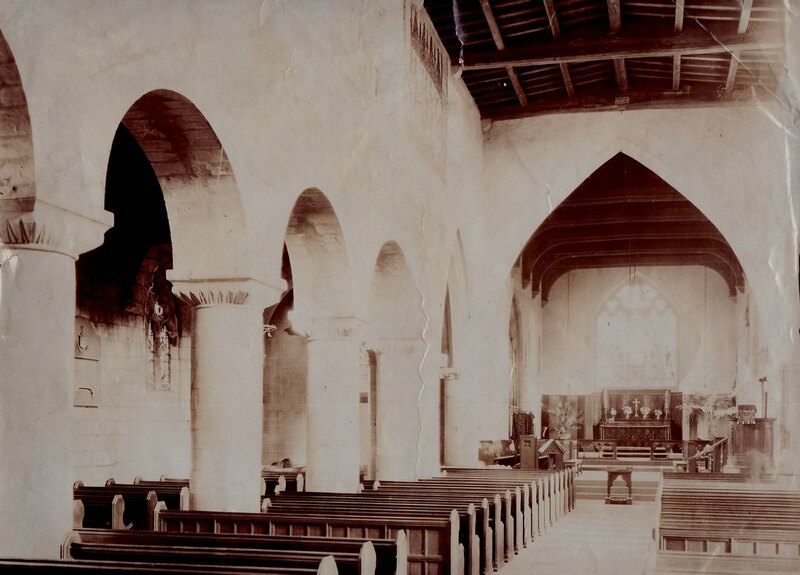 Though a lot of damage was done to the paintings by removing the covering paint and the memorials which lined the nave wall, the Vicar, Rev’d Lightfoot, insisted that where it was possible, restoration should take place rather than leaving fragments. The paintings were consequently extensively repainted and the whole project was finished by 1895. 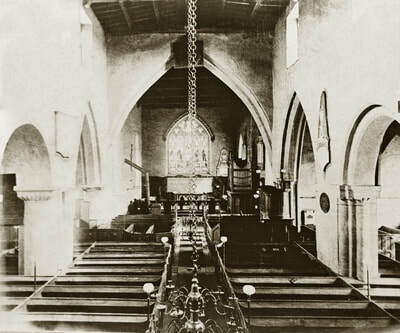 The interior of the Church remained true to the plans of the Victorian restorers for most of the twentieth century. The chancel screen was erected in 1927 and the oak panelling of the sanctuary was completed in the same decade, with a new reredos dedicated in 1930. The vestries were added in the 1930s. St Peter and St Paul’s continues to change with the needs of the community it serves, and in 1997, the Parochial Church Council decided to carry out an extensive reordering. Pews were removed from the west end of the nave to allow the font to be replaced and to provide an open space for congregating after services. The south transept was established as a memorial chapel, and the north transept was screened off to provide more storage space. The vestries were refurbished, and the whole project was completed in 2008. In 2016, and thanks to a grant made available under the Government’s Listed Places of Worship Roof Repair Fund, the roof of the north transept was repaired. For nearly one thousand years, generations of Pickering’s residents have worshipped in this Church, been married at the altar steps and baptised in the font, and have had their funerals here. The work of this Church continues to this day with a vigorous body of worshippers and communicants, who continue to take part in regular worship. This Church is Pickering’s Parish Church and seeks to serve the whole community and to be there for all who need its ministry. Guide books, with more information about the history of the Church and its interior, are available from the Church bookstall. Simply beautiful, tranquil and calm. A great feeling here - a great place to visit. Stunning - what a find! Thank you for keeping the church open for everyone to enjoy. Beautiful paintings. A wonderful oasis to stop for prayer and meditation. Thank you for leaving the church open for all to visit. A beautiful place to experience peace and a lovely place to pray. Many thanks.